This vegan event features free entrance and oodles of local vegan and vegan-friendly restaurants and vendors slinging delicious bite-size portions of vegan treats! Each food vendor has a $4 or less bite-size portion so you can eat all the vegan things without busting your wallet (or gut)! You get to sample bites from a ton of different vendors (and there are so many to try! ), but you also have the option of getting bigger plates if you have a bigger appetite. There are so many restaurants and food vendors this year (50 more than last year! ), and I'm so excited to check a lot of them out! In addition to all the food, there are clothing, beauty, lifestyle, and other vendors selling vegan products, too. 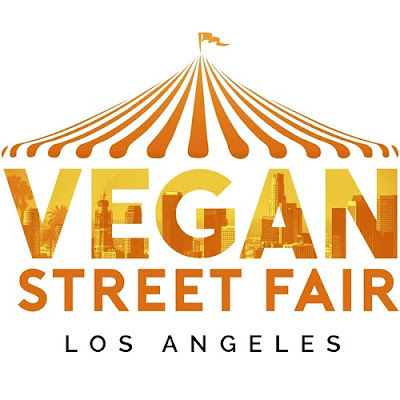 Plus, you get to mingle with like-minded individuals and explore the huge area that Vegan Street Fair covers (they take over whole blocks in North Hollywood!). Sip some beers and hang with friends in the beer garden or enjoy your food at one of the many tables set up throughout the event. It is a really fun, laid-back event that is always a blast to attend! If you want to see what goodies you're in for, check out my coverage from 2017, 2016, and 2015! 2 All-Inclusive Passports available - "The Hits" and "New Kids" - where you pay one price and get a $4 portion from 14 carefully selected vendors. This event is open to the public, with all ages and vegans and non-vegans alike welcome! Come hang and eat all the vegan things at Vegan Street Fair! For more info, visit the Vegan Street Fair website and Facebook event page! Let me know if you'll be going this year!